Today’s job candidates are as likely to be asked which superhero they’d prefer for a boss as they are to describe their greatest weakness. The substance of tough interview questions may change over time, but the aim remains the same: to trip up the applicant and see how they respond to the uncomfortable and the unexpected. Your interviewer is likely more interested in your demeanor as you answer the question than he/she is in your answer. Strategic use of pre-interview research is the key to feeling prepared for anything that might be asked of you. No matter what is asked, remember that you want to compose your thoughts and deliver them with confidence and coherence. 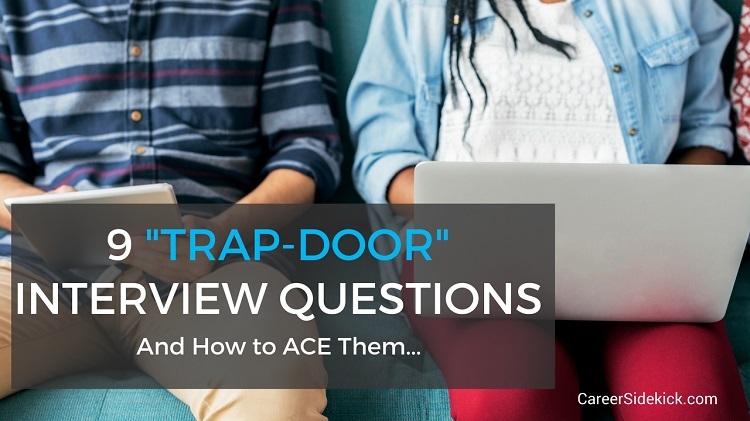 Here are some strategies for answering nine of the toughest “trap door” interview questions. Do your research and be ready with an answer that plays to your best educated guess of what the particular company is looking for in a new hire. Shape you answer into a story about how you’ve worked on one of your weaknesses and turned it into a growing strength. If you can tie this growing strength to one of the skills needed for the job you’re going after, you’ll really ace the answer to this question. To answer this, or the closely related “What is you ideal work environment?” question, research the company’s mission statement as well as any positive news you can find about the company ahead of the interview. Try to weave specifics of both into your answer. For example, if the company has recently launched a new product, and you’re really jazzed about the rollout of this product, mention this in your answer. This question is often asked by employers who are looking for a sense of commitment from candidates. You need to answer in a way that makes clear that your goals align with the company’s and that you hope to grow in ways that align with the job you are currently seeking. This is a crucial interview question that you shouldn’t flub. PS: if you don’t see yourself at the company you’re interviewing at in five years, don’t mention it! Focus instead on the type of role you want to be in five years down the road. 4. Why do you want to leave your current company? Like the “Why did you leave your last job?” question, this question requires you to find an aspect of your current (or previous) company that you liked and that is also present in the company you are interviewing for, and then talk about it honestly. Emphasize what you were able to accomplish in your last role, and how you were able to grow, and never speak negatively about a past employer. 5. Why is there a gap in your work history? Be prepared to answer this question in a way that emphasizes how you’ve employed your professional skills during times of unemployment (this also should be noted on your resume or in your cover letter). If pressed, be honest about how and why you left past jobs, including dismissals, but do not fall into the trap of criticizing past employers. Simply emphasize the positive aspects of each past employment experience in ways that make clear how these past experiences will help you bring value to your next position. Select a mistake that you were able to right, or that allowed you to learn something, preferably a problem you could also confront in your new role. Do not blame a past mistake on others. 7. What can you offer us that other candidates can’t? This is really a way of asking, “What can you do for us?” Make it clear that you are the candidate that can solve their problems by making sure you do the research to find out what those are (or might be), and tailor your answer to those issues with specific examples of how your skills and experience can be applied to those issues. Tell a success story about how you addressed similar issues in the past. 8. What did you like least about your last job? If possible, mention a task that will not be required in the new role or work environment. Don’t focus on politics or people. Then, shift to what you liked about your last job, especially those parts that will also be part of your new role. It’s worth re-emphasizing this point: do not speak negatively about a past or current employer. These interview questions can range from “What would you do if you found out a coworker lied to a client?” to “If you could have a super power what would it be?” Hypothetical questions often, even intentionally, have nothing to do with your area of expertise. Some are designed to gauge your values, but more often they are simply presented to see how you handle a situation you are not expecting and cannot really prepare for. The interviewer wants to see how you think on your feet when asking a “what if?” question. Don’t be afraid to respond to “what if” questions, or any question that makes you feel slightly uncomfortable, by expressing your surprise at the question, or asking for a moment to think through your response. Also, accept the challenge with a bit of mildly self-deprecating humor, and then launch into your answer. Humor will ease the tension—yours and your interviewer’s—and that always leaves a good impression. Since 2005, LiveCareer’s team of career coaches, certified resume writers, and savvy technologists have been developing career tools that have helped over 10 million users build stronger resumes, write persuasive cover letters, and develop better interview skills. Land the job you want faster using our free resume and cover letter examples, templates, writing guides, and easy-to-use resume-builder software.